1. Find a bowl that is roughly the same size as your bread (or bagel thin, as seen here) at the bottom. Depending on how hungry you are, you can use one egg; one egg and a dollop of egg whites; or two eggs. Spray the bowl, beat the eggs and/or whites and add seasoning to taste (personally, I prefer cayenne pepper). 2. Microwave the eggs (covered) for one minute, then add cheese on top and microwave for another 30 seconds. I used a slice of sharp white cheddar this morning, but you can also use shredded cheese, feta cheese, whatever cheese you want! Yum. 3. While the eggs are microwaving, toast your bread and prepare your meat. I usually use sliced deli meat, but you can also use whatever leftover meat you have in the fridge. 4. Voila! 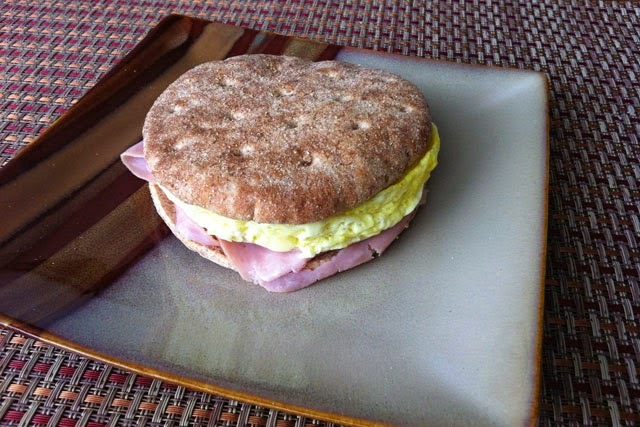 Now you have a delicious breakfast sandwich in fewer than 5 minutes, with only four ingredients and two dishes to wash! :) Enjoy! 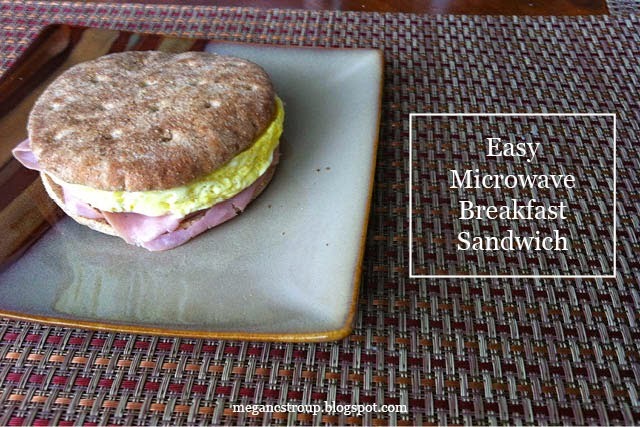 What is your favorite easy breakfast to make in a pinch?